With plumbing and water systems becoming more complex in every household, a water leak is almost certain to happen. Generally it is always going to happen when we least expect it. Therefore, preventative measures must be taken. Total Comfort has the best options for your home and business to ease your mind in the event of a water leak. Follow the Menu to the right to learn about the options Total Comfort has to protect you from an unexpected water leak. Can be installed to your main water supply pipe in either interior or exterior home environments. Once a leak is detected, the sytem system automatically closes the emergency water shut off valve and sounds an alert. 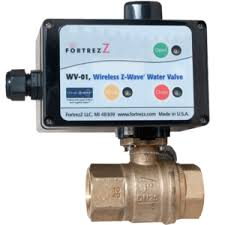 WV-01 is a new professional grade, electrically operated wireless water valve introduced by FortrezZ, LLC. Used in a wireless Z-Wave home automation network in conjunction with any Z-Wave water alarm sensor (ex. WWA-0X), the WV-01 can reduce or eliminate damages caused by leaky plumbing or appliances. Every year nearly over 1 million families have their homes ruined and their lives overturned by water damage and the subsequent repairs. These incidents are always unexpected and the cost of repairs can run into the tens of thousands of dollars. 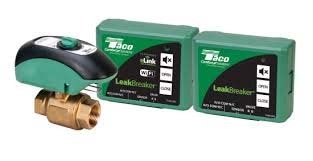 This Patented wireless water detection and automatic water shutoff system can easily be installed on any home's water supply line by a professional, certified plumber. When a water leak is detected, WV-01 shuts of the main water supply automatically. Manufactured with commercial grade seats and seals. Most water heaters fail within 7 –10 years, some 5 million failures every year. Without a WAGS valve, a leaking water heater keeps refilling— and leaking. The WAGS valve is designed to shut off the water supply (plus gas supply for gas-fired heaters) in the event of a water leak from a hot water heater, thus minimizing water damage and possible gas leakage.